So I get into my truck, 94 3.0 4x4 270k+, and I start her up. Well f*ck, guess what, starter motor stays cranking. So I scramble to get under the hood and get the battery disconnected. Took me maybe 3-4 to get the battery disconnected because I only had a crappy little crescent wrench on me. So, I reattach the battery and start her up and everything seems normal again. Started and stopped it maybe 8 times just to see if I could recreate the issue, couldn't get the truck to do it again. If its on the fender mounted relay then replace that relay, take a picture so you know where wires go on the new one, this is the power distribution for the whole truck, so needs to go back together the same way. Last edited by RonD; 01-18-2019 at 10:40 AM. Thanks for the responses, is there anyway to trouble shoot it to figure out what exactly is wrong? The relay, and starter are both pretty much new, less than 6mos old. is there anyway to trouble shoot it to figure out what exactly is wrong? 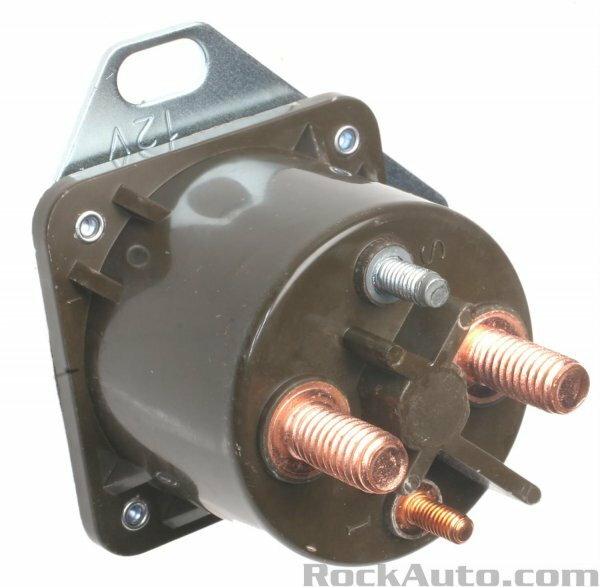 Does your truck have this type fender mount relay? If yes, yours is bad and needs replaced. and like RonD said, take a picture so you can put wires back correctly. Notice the 2 small terminals, 1 marked "S" other marked "I"
Last edited by 2011Supercab; 01-19-2019 at 06:40 AM. If you have a fender mounted relay and it is NEW then I would replace it. New used to mean "we tested it and it works"
The only way the starter motor can continue to run is if it has FULL battery voltage on the larger Positive cable.